With four body variants, three output levels and two drive types, the C-Class is the most versatile and most successful model series from Mercedes-AMG. 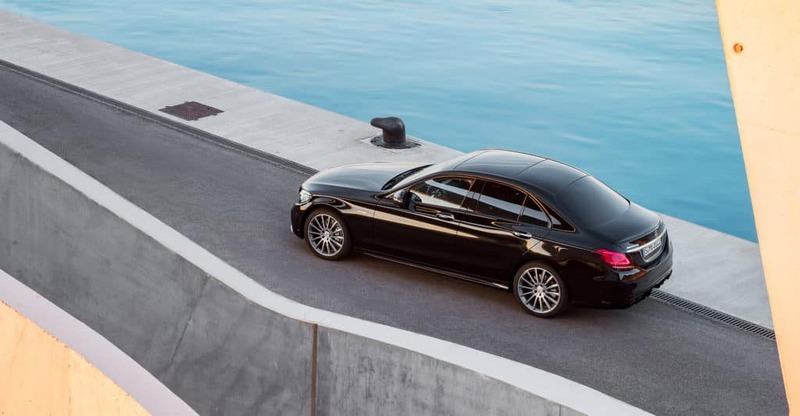 Extensive measures now make the entry-level model C 43 4MATIC Sedan and Wagon even more attractive. The AMG radiator grille in a twin-louvre design, the powerfully sculpted front apron and the new rear apron with round twin tailpipe trim elements visibly enhance the new C 43 models and give them an even more distinct positioning. The interior benefits from an optional fully digital cockpit with unmistakable AMG displays and the new generation of AMG steering wheels. The 3.0-litre V6 biturbo engine now delivers 385 hp. Together with the AMG SPEEDSHIFT TCT 9G transmission and rear-biased AMG Performance 4MATIC all-wheel drive, the engine combines agile driving dynamics with comfort on long journeys. For this the AMG development engineers have increased the output of the 3.0-litre V6 engine by 23 hp to 385 hp. The peak torque of 384 lb-ft is available from 2500 to 5000 rpm. This package guarantees impressive performance figures: the new C 43 4MATIC Sedan accelerates from a standstill to 100 km/h in 4.7 seconds, and the Wagon in 4.8 seconds. The top speed is electronically limited to 210 km/h. The exterior of the C 43 4MATIC is considerably more expressive, even more strongly identifying the new model as a member of the family. New distinguishing features include the AMG radiator grille with twin louvre in matte iridium silver and the powerfully sculpted front apron with additional flics. The side air curtains in the front apron help with optimum guidance of the front airstream. The attachment on the cross fins plus the trim element on the front splitter are finished in silver chrome. The rear view also conveys a sporty impression with two round twin tailpipe trim elements in high-gloss chrome. The rear apron with side air curtain look and the significantly more expressive diffuser improve air flow characteristics at the rear. The spoiler lip on the trunk lid is painted in the vehicle colour. The standard specification includes the aerodynamically optimized AMG wheel with five twin spokes painted in tremolite grey with a high-sheen finish, in size 7.5 J x 18 ET with 225/45 R 18 tires at the front, and 8.5 J x 18 ET with 245/40 R 18 tires at the rear. The optional AMG Performance seats provide optimum lateral support when adopting a dynamic driving style thanks to the special design of the seat side bolsters of the seat cushion and backrest. As an option the seat side bolsters can be adjusted perfectly by means of built-in air cushions. The Performance seats with integrated head restraints emphasise the sporty character of the cockpit. The upholstery in ARTICO man-made leather / DINAMICA microfibre in black with red topstitching equally underscores the dynamic driving character of the C 43 4MATIC. Matching the seat design, the door centre panels and dashboard are finished in ARTICO man-made leather with red topstitching. Aluminium sports pedals with black studs and trim elements in black piano lacquer with light longitudinal-grain aluminiumcreate further sporty highlights. As an option there is a comprehensive choice of individualization options. New features include trim elements in anthracite open-pore oak wood, open-pore walnut plus the combination of longitudinal-grain aluminium for the doors and black open-pore ash wood for the centre console. On top of this there is the familiar AMG trim in carbon fibre / light longitudinal-grain aluminium and matte silver fibreglass. In terms of upholstery, as an option there is leather in black, black with red topstitching, cranberry red / black and also as a new highlight saddle brown / black. In addition, there is a digital display of the current speed and the currently engaged gear. The manual transmission mode is marked with a yellow “M”. The visualizations in the central media display likewise enable further vehicle functions to be experienced even better, e.g. with animated presentation of the driving assistance, vehicle and communication systems. A media display measuring 17.8 cm (7 inches) with a resolution of 960 x 540 pixels comes as standard on board. Another alternative is the 26.0 cm (10.25-inch) media display with a resolution of 1920 x 720 pixels. This is included as standard in conjunction with COMAND Online. Extremely sporty design, a grippy shape with a heavily contoured rim and intuitive operation are the key attributes of the new AMG steering wheel in nappa leather, which comes as standard equipment. It has a flattened bottom section and is perforated in the grip area. The galvanized steering wheel gearshift paddles support a sporty driving style with manual gear shifting. As an option it is also available in nappa leather / DINAMICA microfibre. The V6 biturbo engine boasts a high power output combined with low fuel consumption and emissions. The high power output is in part courtesy of separate, larger turbochargers (16 psi max. boost pressure ). Installed close to the engine, the two turbochargers are especially spontaneous in their response. The AMG power unit can be identified by the engine cover with red aluminum insert and AMG lettering. With the proven DYNAMIC SELECT drive programs “Comfort”, “Sport”, “Sport+” and “Individual”, the characteristics of the C 43 4MATIC can be customized at the tap of a finger. The available range extends from efficient and comfortable to very sporty. This modifies key parameters, such as the response of the engine, transmission, suspension and steering. Independently of the DYNAMIC SELECT drive programs, the driver has the option of pressing the “M” button to switch directly to manual mode, in which gearshifts are executed exclusively using the shift paddles on the steering wheel. The suspension set-ups can also be selected specifically on demand. With its adjustable, electronically-controlled damping system, the AMG RIDE CONTROL steel suspension of the C 43 4MATIC provides both sporty driving dynamics and brand-typical comfort on long journeys. The basis for this is formed by the 4-link front axle and independent multilink rear suspension. The AMG-specific kinematics and elastokinematics with newly developed components result in very high camber stability when cornering at speed. The axial brake connection on the front axle supports the agile and precise handling. The adaptive adjustable damping comes as standard. This fully automatic, electronically controlled system adjusts the damping at each wheel to the current requirements. This improves driving safety and ride comfort. The damping is adjusted individually for each wheel, and depends on the driving style, the road surface and the selected suspension setting. The ideal operating point can be selected at all times on the basis of a broad scope of information relating to acceleration or vehicle speed, for example. Via a switch on the centre console, the driver can select between three different sets of damper characteristics, namely “Comfort”, “Sport” and “Sport+”, and thus individually influence the driving experience — from highly comfortable to sportily taut. After fast laps on the racetrack, driving skills can be analyzed and improved on the basis of the data. In addition, acceleration and deceleration values (e.g. 0-100 km/h, ¼ mile, 100-0 km/h) can be measured and saved. Thanks to a new developed algorithm which determines the vehicle position as precisely as possible, TRACK PACE even detects when the circuit is departed from or shortened. Alongside GPS data, the sensors available in the vehicle (acceleration, gyroscope, steering angle, wheel speeds) are used. The data are displayed on the multimedia display, in the instrument cluster and on the head-up display.